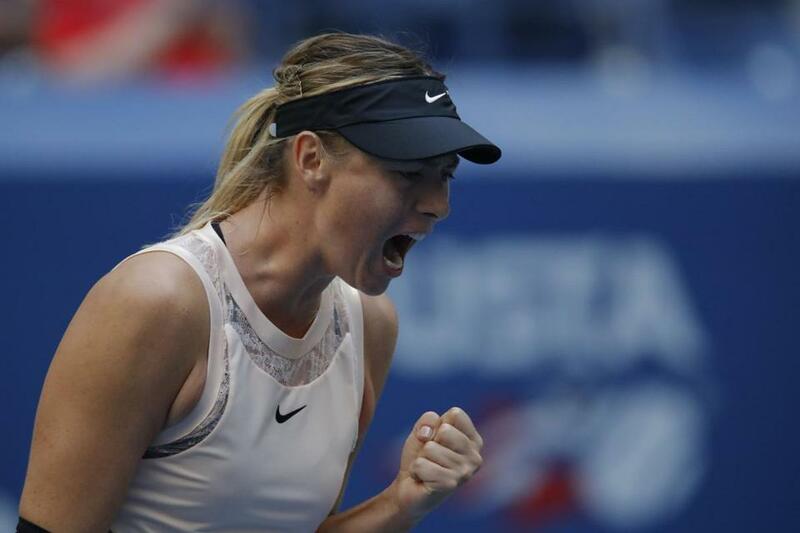 Maria Sharapova pumps herself up after winning a point against Hungary&apos;s Timea Babo at the US Open. NEW YORK — No one, not even Maria Sharapova herself, knew quite what to expect from her return to Grand Slam tennis at the US Open. It had been 19 months since she had entered a major tournament. She played only nine times anywhere since returning from a 15-month doping suspension in April. Two three-set tussles into her stay at Flushing Meadows, it’s clear that Sharapova’s game might be patchy, but she is as capable as ever of coming up with big strokes in big moments — and maybe, just maybe, could stick around for a while in a depleted draw. Sharapova became the first woman into the third round at the US Open by using 12 aces to help set aside a poor start and come back to beat Timea Babos, 6-7 (4-7), 6-4, 6-1, on Wednesday in Arthur Ashe Stadium. It was the highlight of a busy day that featured 87 singles matches on the schedule after rain washed out most play a day earlier. In a night match, Venus Williams reached the third round for the seventh straight Grand Slam tournament. The 37-year-old got broken while serving for each set but played well enough to hold off her big-hitting — and much younger — opponent, beating 20-year-old Oceane Dodin, 7-5, 6-4. Sharapova made a whopping 19 unforced errors in the first set alone, including a pair of missed forehands that handed over the opening set to the 59th-ranked Babos. But as the match went on, Sharapova looked more and more like someone who used to be ranked No. 1 and owns five major titles — including the 2006 US Open — than someone who needed a wild-card invitation from the US Tennis Association because she is now 146th, on account of her ban and lack of play. She cut down her miscues to 12 unforced errors in the second set, then just five in the third, and finished with a 39-13 advantage in winners, looking as strong as she did while eliminating No. 2 seed Simona Halep in a three-set thriller Monday. Not quickly, though: She already has spent nearly 5 hours on court, and so perhaps the yelling and fist-pumping she showed at the end against Babos were as much a reflection of a sense of relief as celebration. If her 14 return winners were a key to getting past Halep, it was Sharapova’s serving that really made a difference down the stretch against Babos: She won 16 of the last 19 points she served. There was a mix of first- and second-round matches thanks to Tuesday’s postponements, and No. 14 Nick Kyrgios, No. 22 Fabio Fognini, No. 26 Richard Gasquet and No. 27 Pablo Cuevas all lost their openers. Two top-10 men whose opening matches also were delayed — and will have to get back on court Thursday — expended little energy: No. 6 Dominic Thiem beat Alex de Minaur 6-4, 6-1, 6-1, and No. 7 Grigor Dimitrov won, 6-1, 6-4, 6-2.